Logwood – Devon Blue Face (handspun and fibre) –v- Logwood, BFL and 56s English. Fustic and Teal. 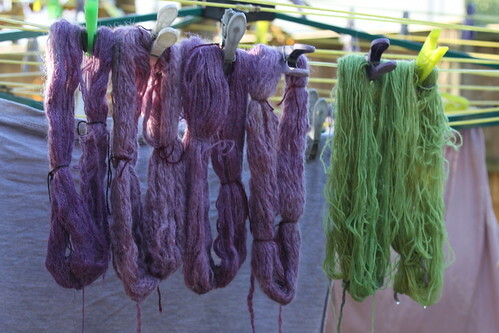 (when combined in same dye bath, they give the delightful lime green above). These are all from the Earthues Extracts - D T Crafts – except that I have just been on to the website and have misunderstood thinking all the dyes came from Earthues… the Teal and Logwood are Hue and Dyes – Debbie’s own dyes, not Earthues – I am so smitten, and now I can see that I can buy them individually rather than having to shell out for a complete kit. Hue and Dye also have other complimentary colours such as Sandalwood – another one of “those” extracts which I lost the will to live preparing, so didn’t. 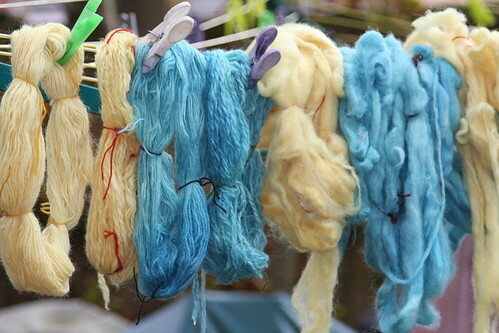 For whatever reasons I have always associated natural dyeing with a lot of fuss as I have blogged about before, but I am pleased to say that these preparations are idiot proof !!. Well I think probably the instructions being so clear and concise has helped. 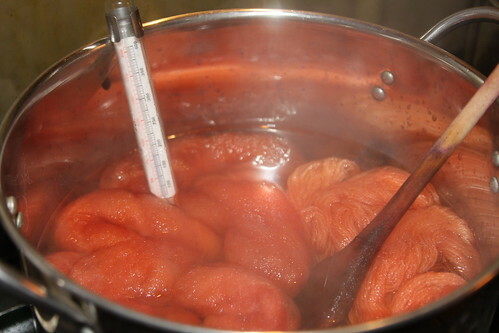 I have been careful about the quantities used, and whilst have had even dyeing, there has been absolutely zero exhaust. 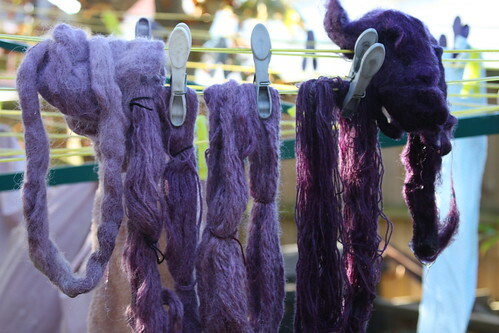 This makes them very cost effective when you see the quantities I have dyed so far, and consider how far 10g goes. I have a pot of single skeins of each colour to “sadden” tomorrow. Was going to happen today, but lost the day with the gas man not turning up (eloped with my friend’s washing machine repair man I think.!!.). Now I am a “proper” dyer I feel quite grand. 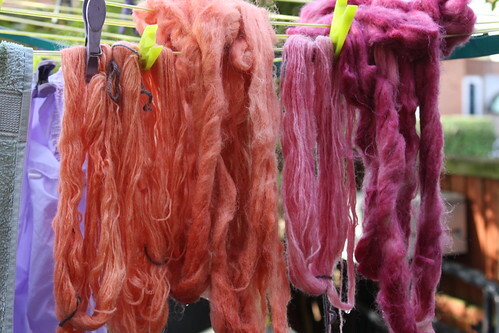 But I must confess I can see the difference – quite a lot actually, between the soft and gentle bloom of the natural dyes and the harsh – in your face – of the acid. I love “in your face” – not being a subtle shy and retiring sort of gal, but sometimes it has to be said you need delicate for a specific project – and these are the ideal way to do it. I am going to try some tinctoria as well – as I loved a project a friend of mine did earlier in the year and would like something similar – also it will be good to compare ease of useage. These colours also relate nicely to my watercolour palette, which is quite inspiring in itself, so have gone and treated myself to a book on colour theory. Would be useful if I actually could think about that properly, rather than my unscientific approach thus far. One of the things I learned this week also is where the word Mordant comes from:- Wikipedia – Mordant – mordere (latin) - to bite.. I am going to be a whizz on quiz shows in the future I think – a whole new career opening before my very eyes !! Changing the subject totally, Cloth Paper Scissors - Interweave Press asked for pictures of spinners’ studios. I didn’t think they would be very impressed with my hovel – nay the Bothy - at present (but I am, it is incredibly cosy, but not really worthy of bragging about) but love the idea of being inspired by others. 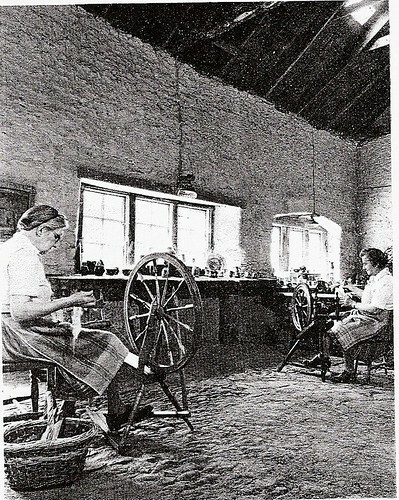 The Old Forge used by the Quantock Weavers in Spaxton (I think – or it could be Over Stowey – or The Holt). We knew it after these good ladies had given up, first I came by it by chance when kids were screaming in the car and we came off the motorway to give our ears a chance to recover. I found a delightful (young !! which was rare in 1990 or so) lady spinning and bought a smashing fleece from her. There were plenty to choose from bundled up around the room and she looked sublime and peaceful – with wool marketing literature adorning the walls, and the smell of fleece and industry around her… until she told us she was closing up – something to do with needing to make a living (theres a surprise). Then a year or so later the house came to our attention when we were looking for somewhere to bring up our young family. Right price – stunning location – dye copper still in the garden with flowers in I seem to recall. Estate Agent very vague about local history, but quite impressed that anybody had even the vaguest clue about what he was on about (he seemed to think it was linked with witchcraft). To make a short story long - Everything going grand, until the woman selling wouldn’t give vacant possession – the sale was being forced through divorce I seem to remember - WHAT ? !!! I can’t blame her for not wanting to give up her home, but what were we going to do? So it all fell through. I have been looking for a similar working place ever since. Ambience and industry – with space to make a mess. If anybody reading this remembers the lady I spent a delightful afternoon nattering to – (while kids annoyed local community) and who had such an impact on me – please let me know her details – better still if you have a more up to date photo. If anybody remembers the exact location – and it has been built on – don’t let me know. Let my memories stay as they were… they are the stuff that fill my dreams that in turn feeds my soul and fuels ambition which in turn leads me to put one foot in front of the other each day with happy tread ! !